What will work be like in the future, and how will we respond to it? These are big questions being asked by the influential and much respected Professor of Management Practice at the London Business School, Lynda Gratton. The answers she is uncovering are both obvious and important. We won’t know if her work is ‘right’ until the future arrives, but for now, we would be wise to understand the trends Gratton is uncovering, and respond to them. 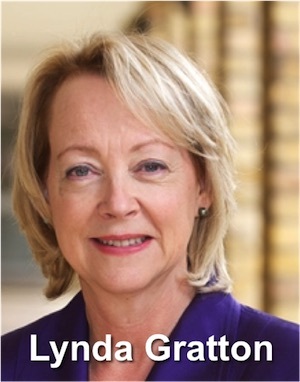 Lynda Gratton was born in 1955 and, grew up, and was educated in the north west of England, in Liverpool. She gained her BSc in Psychology from Liverpool University in 1976 and started work there on her PhD. In 1979, she started work with British Airways as Chief Psychologist, while continuing her doctoral studies into Maslow’s Hierarchy of Needs. She was awarded her PhD in 1981 and, in the following year moved to management consulting firm PA Consulting. She stayed at PA until 1989, becoming their youngest Director at age 32. But Gratton valued the autonomy to create time to read, think, and be with her family above the high salary. So she took a post as an Assistant Professor at the London Business School in 1989. Gratton’s academic career has resulted in praise and awards. She has authored 9 books to date (the ninth is due out in June 2016) and many influential papers, the most widely read being two Harvard Business Review Articles: Eight Ways to Build Collaborative Teams (Nov 2007) and End of the Middle Manager (Jan 2011). We need to start our summary of Gratton’s most important thinking with the forces she identifies as driving change in the world. I think each of us might add one or two of our own, but it is hard to dispute that each of these five will have a big impact. What gives her list credibility is the wide range of big name organisations that collaborated in her research. Here we can see trends like labour force mobility, especially in the direction of mega cities that are, increasingly, in the East. This is feeling and fuelled by the emergence of the new economies; the so called BRIC and MINT nations (Brazil, Russia, India, China, and Mexico, Indonesia, Nigeria, Turkey – along with other less acronymed nations like South Korea and Egypt). Many of the new dominant player will bring new cultural and societal norms to the world of work. The biggest changes will be shifts in life expectancy and the struggles of Western nations in particular to meet expectations around retirement. But as populations age and birth rates decline in the presently less developed nations, the same effect could have far greater implications. There are so many trends here – many linked intimately with technology, globalisation and demographics. Women’s social and economic power cannot (and should not) do anything but rise. 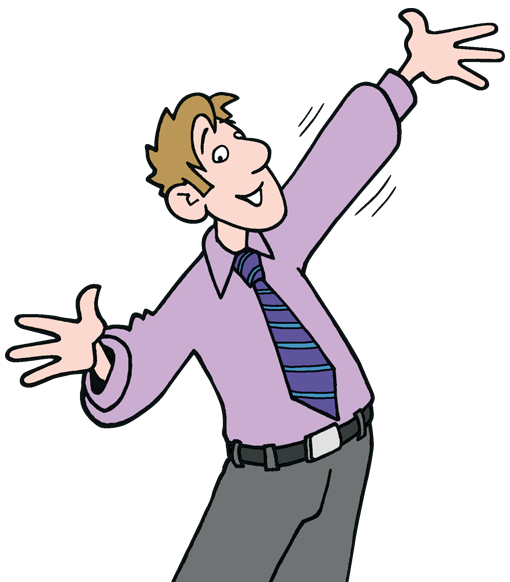 Freelance work will increase to take advantage of technology and meet the caring needs of people with ageing relatives. Predictions of the demise of family life or the increase in attention given to families from home-based workers seem the most confused – but then the future may not yield neat categories. The need to shift to a low Carbon economy to protect the world from rising atmospheric CO2 levels and the inevitable devastating consequences of the global climate changes it will drive will increasingly dominate our futures. This will have complex economic impacts – but nothing compared to what will happen if oceans rise substantially and crops fail around the world. I’d like to see Gratton give more attention to the consequences of water stress and the geopolitical impacts of large mismatches of water availability and need that we can readily predict. These are big forces and Gratton envisages three big shifts in our lives. There are too many generalists, so the law of supply and demand will crush their economic value. This will drive a shift to in-depth mastery and narrow specialisation of workers. We can easily see how she comes to this conclusion, as the five forces combine to drive and facilitate this shift. From my point of view, her third shift is the most parochial: a move from focusing on standard of living to the quality of our experiences. In Gratton’s timeframe of now to 2025, I doubt this will be a major trend outside the wealthiest parts of the world (and, even here, it may only apply to the wealthy middle and affluent classes). The displacement of work by machines has been heralded for over 100 years and the rise of hedonistic society for many hundreds. I’d like to buy into this one, but it feels most like a consumer business driven rehash of an old trope (Sorry Lynda). What I do one hundred per cent buy into is Gratton’s assessment of the big impacts these shifts and forces will have on global-scale organisations. Small, local organisations will lag behind, but even they will need eventually to bow to some of these changes. Connectivity will drive the need for more transparent leadership of our corporations (while many will fight it, fearing the impact of consumer reactions). This will need a more authentic style of leadership from individuals throughout those organisations. Cross border, cross timezone working has grown up over the last 20 years, and will increase. From my perspective, real, empirical research in how to drive high performance from virtual teams is still lagging this trend. This is a hard question, because we evolved to co-operate in small, intimate, and geographically contained teams. We need to find ways to optimise our reactions to an alien environment. ‘Social Capital’ is not just something we acquire as individuals, Gratton suggests. Corporations need connectivity to drive innovation and profitability. I predict that these wider eco-systems may yet morph into the dystopian mega-corporations and global cartels of science fiction. As more workers become independent freelancers, and consumers become more savvy about what they want, corporations will increasingly need to extend their relationships to more fully engage with them. You didn’t see this one coming, did you? (Joke) If social, demographic, and lifestyle preferences are shifting, then so too will work patterns. And this will require flexibility from employers. Hear Lynda Gratton talking about how to be ready for the future now, at a TEDx event at the London business School in 2012. Margaret Heffernan’s caree has been varied and successful – with roles in television production and leading large organisations. Her current focus is as a thought leader in the world of organisational effectiveness, where her ideas are both interesting and practical. 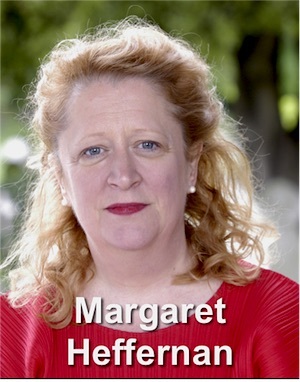 Born in 1955, in Texas, in the USA, Margaret Heffernan grew up in the Netherlands, finished her high school education in London, and graduated in English and Philosophy from the University of Cambridge in 1977. This gave her the perfect (and familiar) springboard for a career at the BBC, where she became a television producer, working on documentary, news and arts programmes. She went on to run the Independent Programme Producers Association (IPPA – now a part of PACT), before heading off to the US in 1994, to work in public relations, focusing on the technology and media sectors. Through the late 1990s and early in the 2000s, Heffernan seized the opportunities of the internet and became CEO of several new businesses: InfoMation Corporation, ZineZone Corporation and iCAST Corporation. In these roles she won a series of plaudits from industry commentators as a top influencer in the high tech sector. In 2004 Heffernan entered the ‘portfolio phase’ of her career to date, combining visiting academic roles, writing business books, blogging and commentating, and speaking. She recently published her latest book and has had three appearances to date on TED (a high number – only a small handful of people have spoken three times or more). 2015: Beyond Measure: The Big Impact of Small Changes. Margaret Heffernan has a knack for synthesising the ideas from psychology with her real-world experience as a senior executive working at the sharp end of business. This makes her ideas very appealing to business people who like to feel that academic ideas are grounded in genuine experience and that their practical wisdom is rooted in sound research. The clearest thread running through Heffernan’s published thinking is the importance of ‘Social Capital‘ – the network of social relationships that make business effective. Her earlier work focused on the different attitudes women have (compared to men) to ambition, power and motivation in the workplace. Their success comes about, to a fair degree, through greater levels of social interdependency, and Heffernan shows that women-led organisations statistically outperform organisations led by men and attributes the difference to that factor. In her next book, A Bigger Prize, Heffernan starts to look at what makes organisations successful and determines that it is not about being the best or hiring the best or nurturing the best: it is about creating a culture of helpfulness, so that everyone is comfortable with asking for help and ready and willing to offer their help. Competition is damaging and co-operation is adaptive. This is another topic I found absorbing and, when put back to back with an all-time favourite book of mine, ‘The Origins of Virtue‘, Heffernan and Ridley have covered a lot of the ground that most fascinates me in this arena. Heffernan’s latest book seems like a continuation along the same trajectory. Indeed, the five core ideas in Beyond Measure feel like something of a summation of her thinking. Maybe this one quote summarises everything: ‘Walk around. Talk to people. Turn the other cheek. Build a network. Feed that network. Don’t get boxed in.’ Not a revolutionary idea, but a small change that can have a big impact on the way you do your work. Margaret Heffernan’s most recent TED talk. The subject of her latest talk, Why it’s time to forget the pecking order at work, is drawn from her book, A Bigger Prize.